Towering over the heart of Rangoon is what Rudyard Kipling called Burma's "golden mystery": the Shwedagon Pagoda. One hundred metres high, covered from top to bottom in shimmering gold leaf and more than 1,000 years old, it is for Burmese Buddhists the country's most sacred site. I was there posing as a tourist. Foreign reporters are barred from Burma. In the grounds of the temple I was approached by a young man. He wanted foreigners to know what was happening, he said. He came from a village in the Irrawaddy Delta region devastated by the cyclone, a village which is now only water. "In my village about 1,000 people are dead now," he said. The village had seen no aid organisations and received no help, he said. And for that he blames the government. "After the cyclone we never saw the UN or other organisations," he said. "They want to help but the government has closed my place to visits. They know about the cyclone so why don't they come to help?" With more than 130,000 people dead or missing, and 2.5m in need of food, shelter and medicine, Burma's generals have been lambasted from without and within the country. They are used to thumbing their noses at foreigners, but they may not have expected the fury of their own people - people like Zargana, a famous comedian here who has spent time in prison for criticising the generals. Like many other Burmese he has travelled to the stricken areas himself, in defiance of the authorities, to donate food and water. "The victims are very angry with the military junta," he said, but added that they were not the only people frustrated by the lack of aid. "The second group is the donors... They want to donate directly to the victims but the military junta and some police are stopping them from donating directly." "Thirdly there's the government officers," he added. "They are human beings. Some of their relatives disappeared in the delta region but they couldn't go there, so they feel anger towards the military junta." One reason Burma's government was slow to react is that it was too busy pushing ahead with a referendum to consolidate 45 years of military rule. Five years ago the generals silenced the one person who had done the most to undermine them: pro-democracy leader and Nobel Peace Prize winner Aung Sang Suu Kyi. 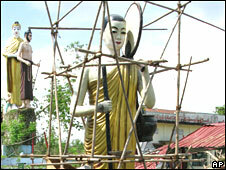 It is not difficult to find the home of Burma's most famous person. I stood across the road from it. Entry to the street outside was blocked by five armed guards. She has been under house arrest here since 2003 and the generals have just added another six months to her detention. Last week a group of protesters tried to march to her house, and for their troubles most were arrested. 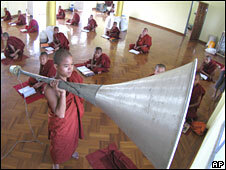 In September Buddhist monks led the largest protests in Burma since 3,000 people were killed when they took to the streets in 1988. So could there be more unrest? Zargana thinks people are too scared to march, but he says there is a visceral anger in the aftermath of the cyclone that may yet erupt into violence. "People don't want to come out onto the streets. But the people are very angry and they want to take some kind of revenge," he said. "This is very horrible. I don't want to take revenge. But our people now want to kill." This sentiment was echoed by the man who approached me at the temple. "A lot of people are angry at the government," he said. "Near my village people are fighting the military for food, water and medicine. "They are hungry, they are thirsty. They have the food, the water, so why don't they give it quickly to the people?" This weekend the United Nations children's fund, Unicef, reported that government soldiers had begun forcing people from places of refuge in the cities back to where their homes once stood. 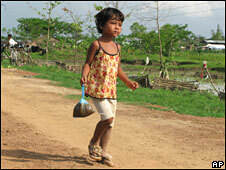 Aid agencies have recruited as many Burmese as they can to get to the areas that foreigners cannot reach. 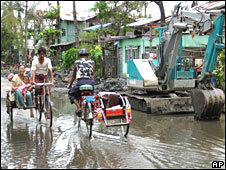 But most of the victims of Cyclone Nargis are picking up the pieces of their shattered lives alone.